Some runners who blog never give details of their training at all - I have always disliked the "keep your training secret" approach as I have benefited so much from the "freely you have received, freely give" approach. Others will give details of key runs and key principles, but not all the minutiae of details - this is great but I often find it frustrating as the details are often the crucial part. Others will tell us every they have done in training routinely - that is a huge blessing to me and if you don't want those kind of details, you can skim over those posts or ignore them altogether. I have not posted up my training details fully before for several reasons, one of which is that I really am nothing special in the running world. Please do not take me now doing so as any delusion of grandeur! It's just that I am unusual in my approach (higher mileage) and am now doing ultras; I myself have scoured the web looking for all the information that would help me cover a ridiculous 100 miles as quickly as possible. I will approach it my way and I am aiming to be fairly competitive - I'm not looking to simply complete a challenge in the middle of the pack. So any reader can, like me, look back at what I have done in training, how I have performed in races and learn what they can from it. Even if it is a case of learning not to do this or that, it has been a productive exercise. I do not ever want the pressure of getting my training up on a weekly or bi-weekly basis routinely. My life is not conducive to that right now (for many reasons). So what I am going to do is put the training up, sometimes more detailed and sometimes less so, but it will all be there. However, it will be posted sporadically - I may go for a month or more without posting it, I may do it weekly or I may have a great session and post up just a few days after my last "point in time" post. 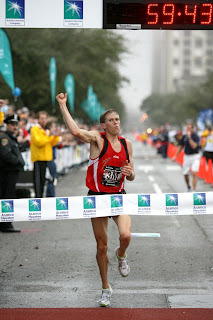 I would love to be able to see Ryan Hall's training log for the 12 months leading up to this race! If you read it and if it is helpful, do let me know, either in the comments below, on Facebook or privately. If nobody says they want to see it I may not bother. But, like I said, I love reading this kind of stuff from others, and there must be others like me out there.